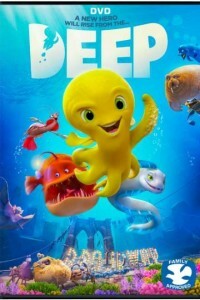 In the Deep DVD, when a playful octopus named Deep gets his undersea fish colony in trouble, the tribe’s stern leader Kraken orders Deep to go find help. Joined by his splashy BFFs—a sassy shrimp and a silly anglerfish—Deep takes an epic, colorful journey through submerged cities and sunken ships, where they meet outrageous creatures that help the trio on its way. Throughout the adventure, Deep and his buddies laugh, sing, and bond with one another, proving that friendship can be a very “deep” subject.